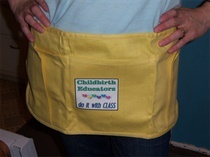 Sturdy, cotton waistband aprons in two styles. One style is neutral with green trim (pictured) with 4 roomy pockets. The other style comes in either forest green or sunny yellow with 2 regular pockets and one extra large pocket. 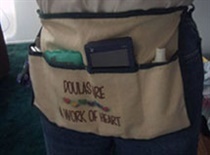 The tool belts can hold your massager, massage oil, PDA, phone, notepad, pen, hair clips, reheaters, lip gloss, or whatever the doula or midwife needs on hand when the laboring woman needs constant, uninterrupted support. 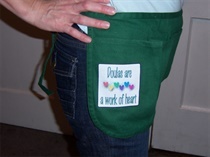 They have different sayings, such as "Doulas are a Work of Heart" or "Childbirth Educators do it with Class" or "Midwives Support Perineums" but can have any phrase you wish! I can even print your logo if you email me a jpg file.